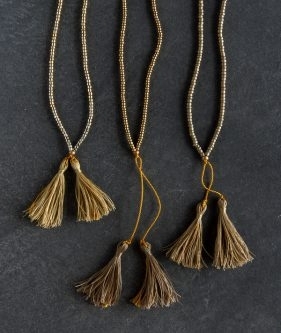 Our Beads + Tassels Necklaces are our first foray into the world of beading, but definitely not our last! 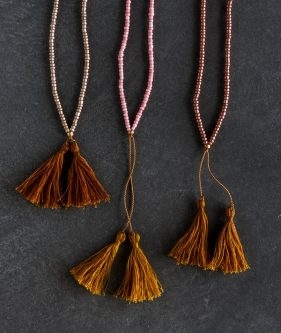 Easy, portable, and so much fun to make, these lovely strands are a wonderful introduction to beading and jewelry making. 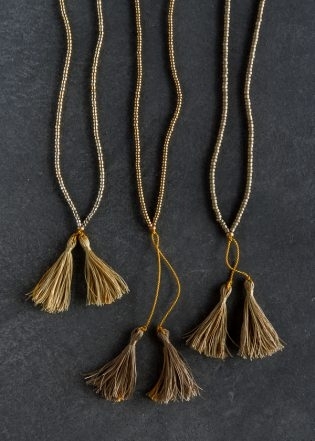 And maybe best of all at this time of year, both the Kit and the finished Necklaces make amazing gifts! 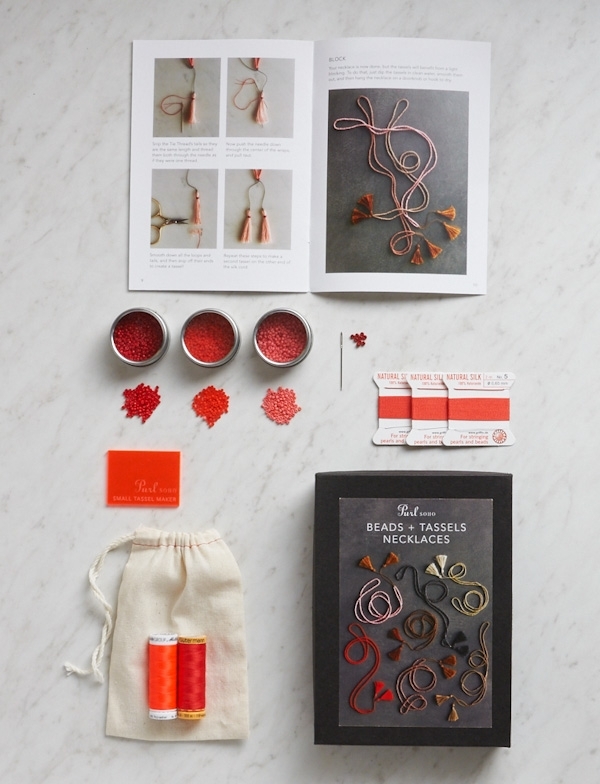 Our Beads + Tassels Necklaces Kit makes getting started very easy because it comes with everything you need, including a step-by-step Pattern, three Tins of Seed Beads, and even a Small Tassel Maker tool. 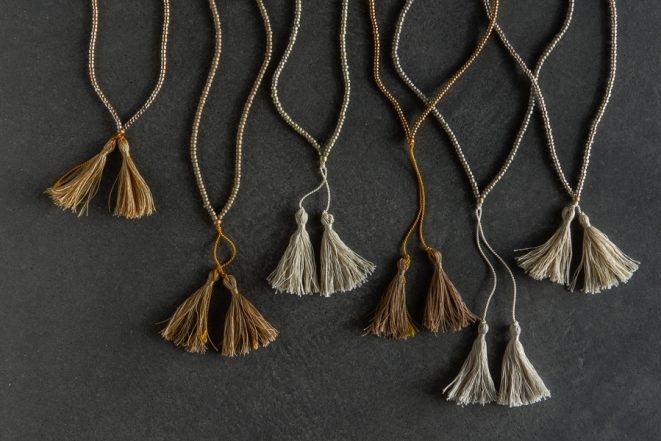 Each Kit makes three necklaces in three colors, and there are six palettes available, from warm and earthy Copper Spice to cool and airy Arctic Silver. All of these components are also available on their own by clicking on the hyperlinks. 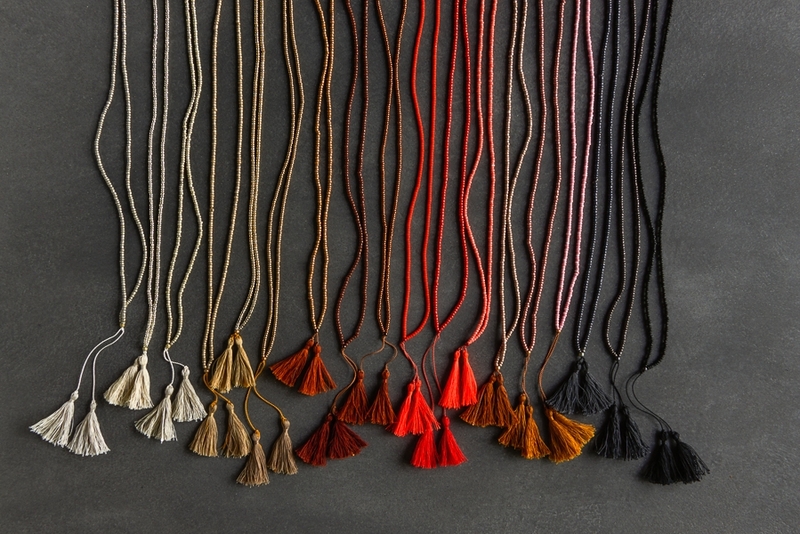 If you already have what you need, our Beads + Tassels Necklaces Pattern is available on its own as a hard copy or PDF download. 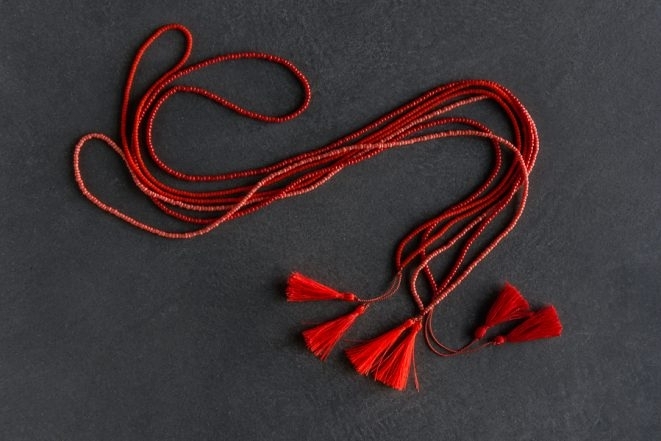 I’d love to see a photo of someone wearing this. Thanks for writing in! 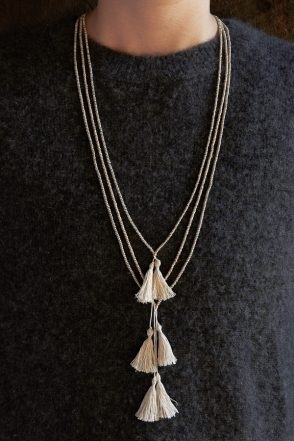 At present we do not have a picture of the necklace on someone but we will certainly take your request under advisement! 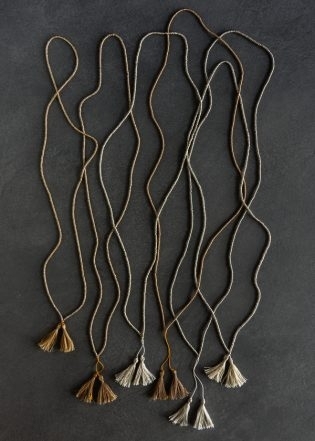 We’ve added a photo of the necklaces on a person to the post! Thank you so much for writing in! 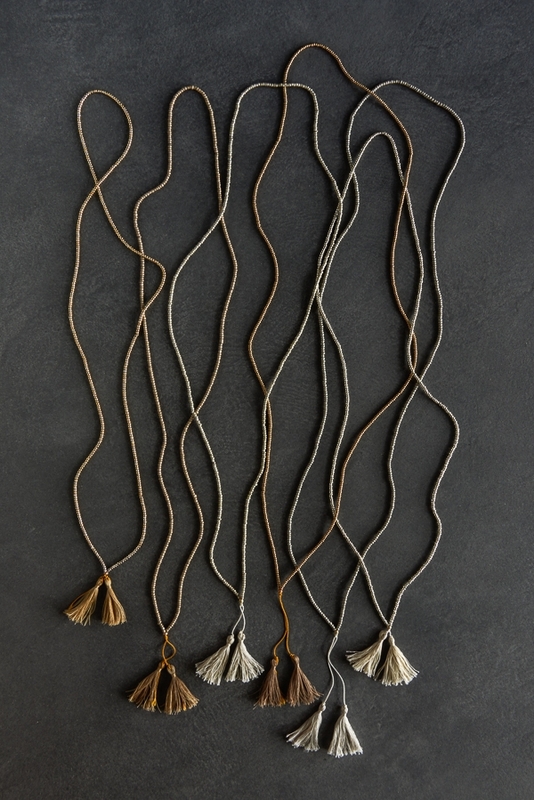 You are not alone in your desire to see these lovely necklaces worn, we’ve put in a request for just such a photo! Beautiful! Each colorway better than the next. 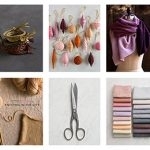 Do you know when the kits will be back in stock? I apparently waited too long to buy one! Thank you for writing in! 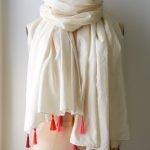 These lovely kits are very popular and as you noted, sold out quickly! 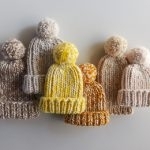 You are more than welcome to give us a call at our NYC shop ((212) 420-8796) or at our warehouse ((800) 597- PURL) or you can send us an email at customerservice@purlsoho.com and we will be sure to contact you as soon the kits come in. Please let us know if you have any more questions! 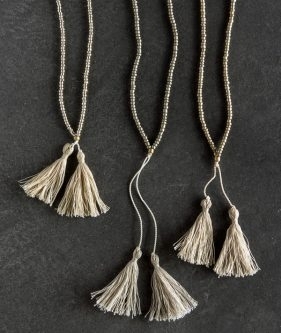 Any idea when these beautiful necklace kits will be back in stock? Thank you for writing in and thank you for your kind words! 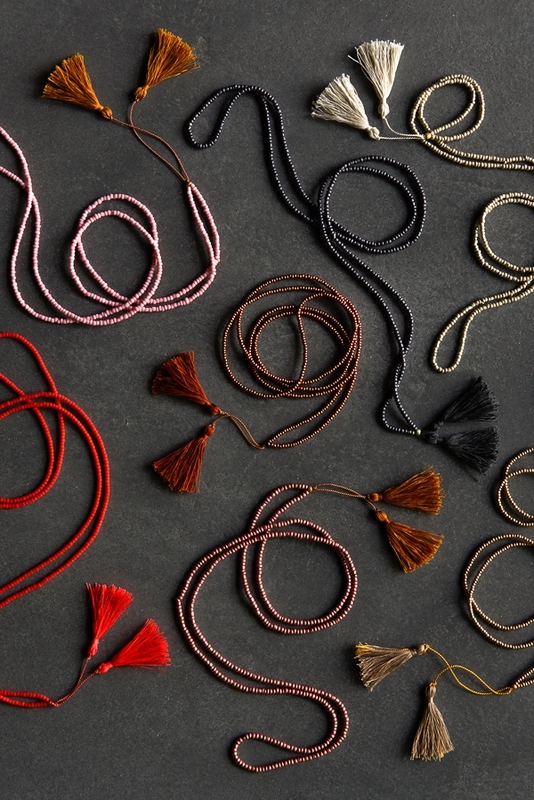 If you are interested, you are more than welcome to give us a call at our NYC shop ((212) 420-8796) or at our warehouse ((800) 597- PURL) or even send us a quick email at customerservice@purlsoho.com and we will be sure to get in touch with you as soon as the kits come in! Please let us know if you have further questions! 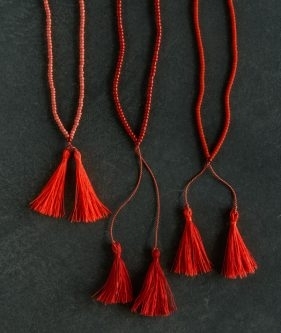 I usually buy beads by mm size. 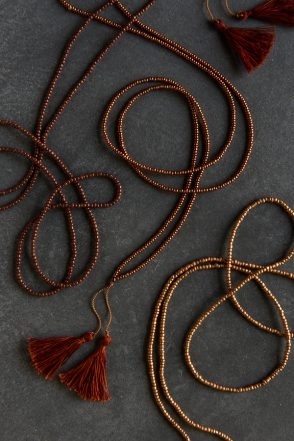 Can you tell me how many mm a size 8 bead is? Thanks for writing in! 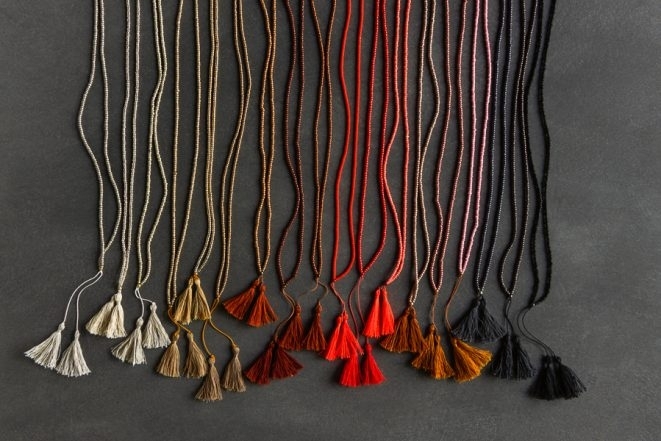 I have looked up multiple charts from multiple sources and it seems that there is not consensus on the millimeter size of size 8 seed beads. 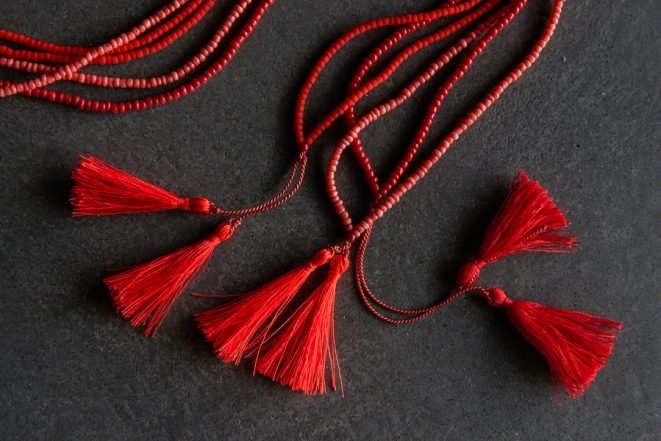 Our size 8 beads measure between 3.0 and 3.1 mm. 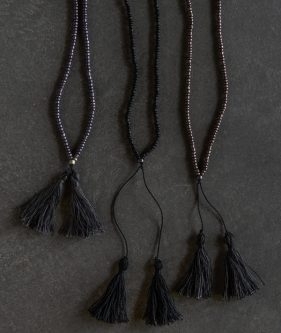 I made these beaded tassel necklaces for a Christmas present and they are beautiful. Chic and minimal. 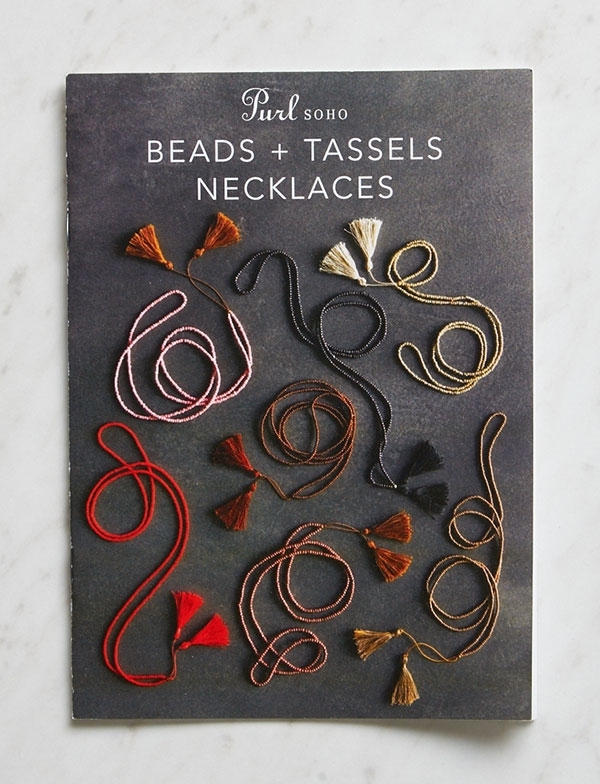 As usual, Purl Soho puts together a beautiful kit. I was delighted at how quickly they went together, but I’m a maker and fixer of all things. I even glue handles back on mugs!! 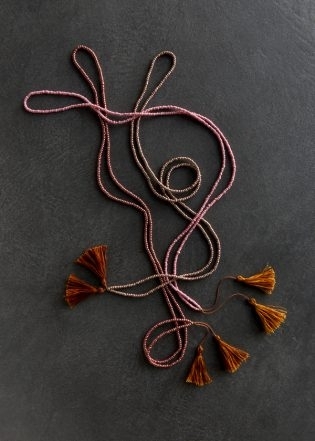 Hi I got your kit and I am struggling with the direction to make a square knot around all of the tassel threads 1/4 inch from bead. 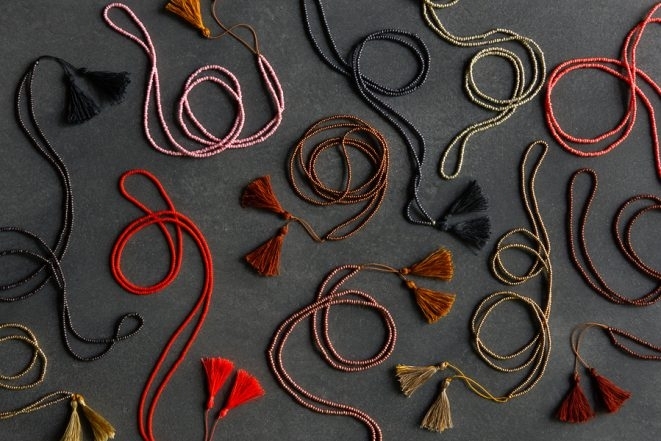 Is it possible to make a square knot with one silk thread? 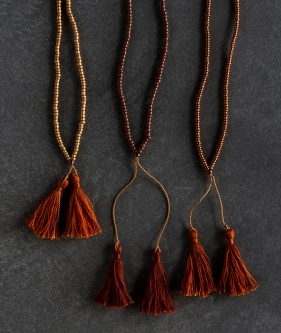 Not sure what I am doing wrong but I do not seem to be able to tie a secure knot. Thanks for writing in! 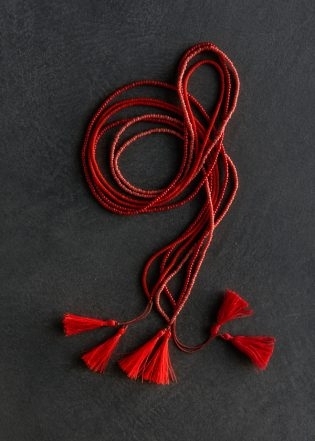 We did knot a single silk thread around the tassel threads. 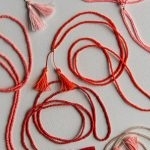 The square knot should secure it quite nicely. 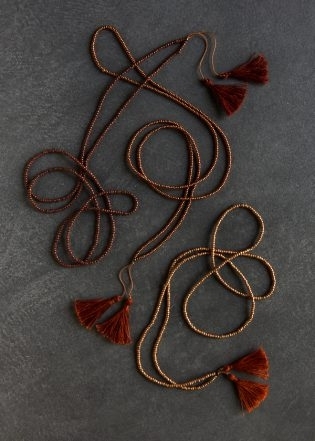 If you feel that it is not secure enough, you can certainly knot another square knot on top of the original knot. 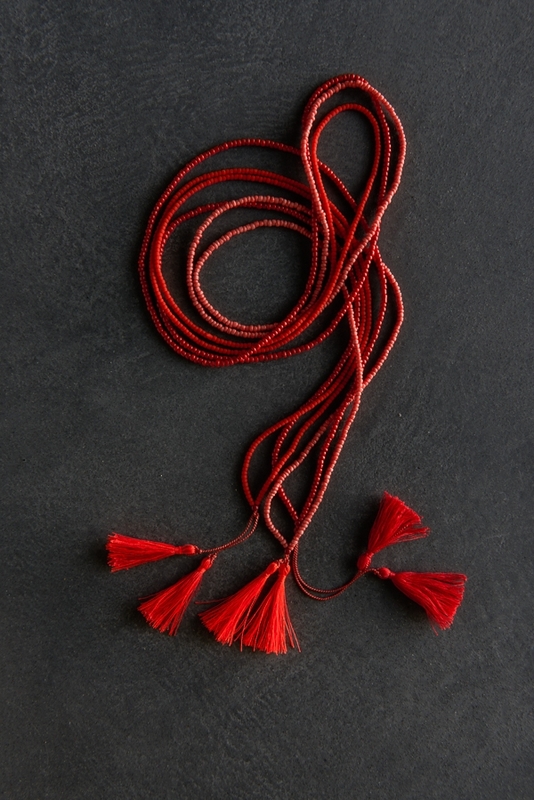 A surgeon’s knot is more secure when making jewelry, tassels, etc. You can find an illustration with Google, but essentially it’s just putting the end through a second time when you make the first tie, and then put the end through once as usual when making the final tie. 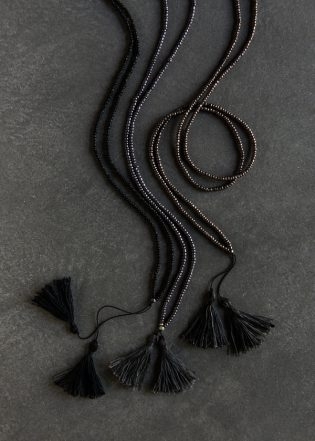 I was excited to begin making my first necklace but the end beads provided are too small – I am unable to secure the end bead as the knot at the end of the needle will not pull thru the second time – barely made it over the first time. Any pointers to assist me with this first step? I already have tried threading the non-needle end thru but was unsuccessful. 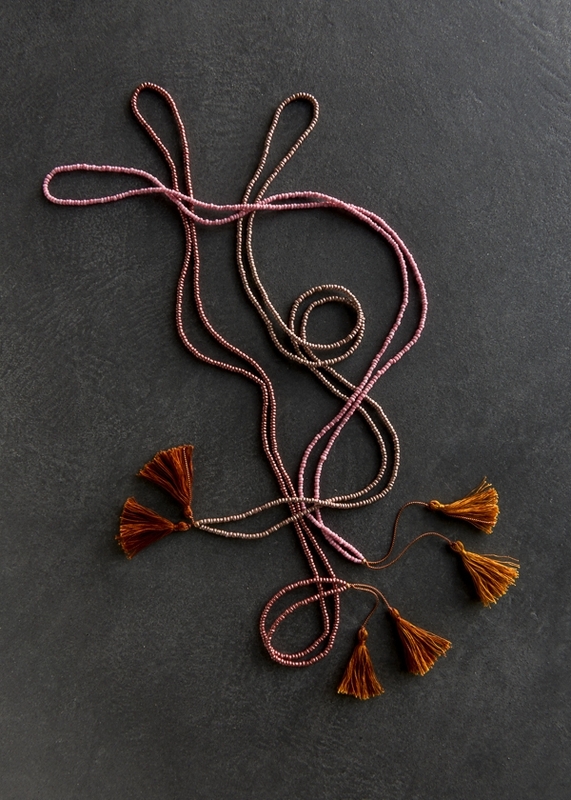 Updated – I tried the other silk threads and their knots are much smaller and usable. I think I will need a replacement thread as only 2 of the 3 work. Thanks! I’m sorry this happened! Does it for sure not work on one of the threads or did you mange to work it out? 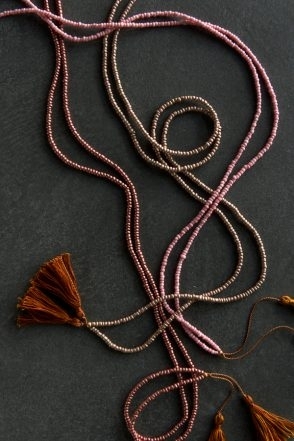 beaded necklace looks so classy and good!